It's November already!! Where did this year go? 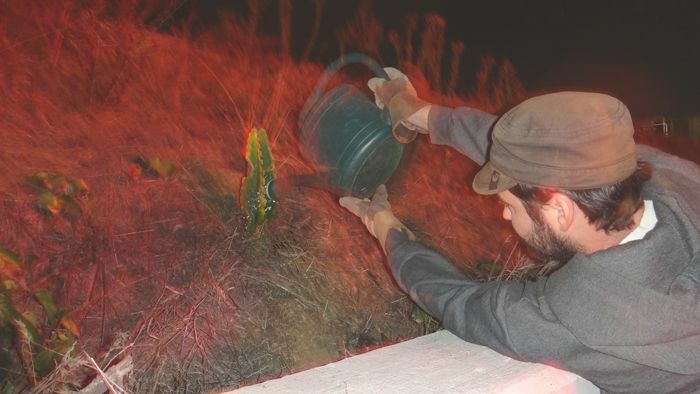 Last night we celebrated Halloween with a little guerrilla gardening across the street from our house. When I say "we," I should clarify that I am usually the lookout, liability and/or photographer in these missions, whereas Ryan is the green thumb and the inspired guerrilla gardener. We planted a cactus that Ryan had liberated a couple of weeks ago during our walk up to Nate's Point dog park. It's a bright little slice of greenery in an otherwise drab, often littered highway embankment. We've also planted golden poppies there before (and will again), so the cactus makes a nice addition. After a successful mission, we headed into Aero for some Halloween nightcaps. It was a decidedly less hectic holiday compared to previous Halloweens that we've spent at Monster Bash downtown or at Nightmare on Normal in Hillcrest or throwing a huge house party. Truthfully, I was really uninspired this year. I couldn't think of a costume idea that I liked to save my life. Now that November is here, I'm attempting to squeeze in a few extremely chill days before the craziness sets in. Next week my dad and brother and his girlfriend get into town and then the 3-Day is the weekend after and then Thanksgiving and then holiday parties and then Christmas and Ryan's birthday and New Year's Eve in rapid fire succession. I'm exhausted just thinking about it. Not to mention, I'll be training for Carlsbad the whole time. Which should actually be a good thing since it'll offset all of the food I'll be eating.